I love nikko hotels. This one in union square is great! Big rooms, great location. Good food, great staff. Enjoyable. Location makes travelling around easier. I forgot a pouch in the hotel lobby after I had checked out of the hotel. The staff were very efficient in locating and reacquiring the pouch for me. We really enjoyed our stay at Serrano Hotel. This hotel has a ton of character and each staff member I encounter was delightful. The location of the hotel made the city accessible on foot which was a plus. I will definitely stay at Serrano the next time I'm in San Francisco. Clean quiet small interior room. Loved the free cookies :). Great front desk staff. I would stay again. We encountered a booking issue at another hotel so decided to search and book literally last minute through Agoda. Checked in half an hour later and everything was fine. Great room, good size, great beds, bathroom and very friendly staff (with minor exceptions downstairs). I paid for Bayview, but that side is too noisy, due to contruction. Tehy upgrade me to executive floor after. They charge me by mistake for their parking, but was reversed after my clearing it up with them. My boyfriend and I went to San Francisco for thanksgiving. This boutique hotel was great for value and close to Chinatown. It was a little further away from city center than other hotels but the distance was still walkable. The room were nice, clean and comfortable. There is also a bar on the second floor and complimentary breakfast (although the options were very limited) Our stay was very enjoyable and I'd definitely go back. 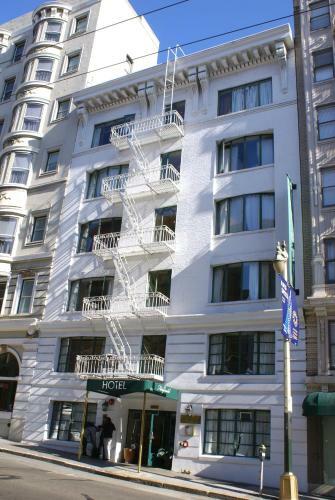 I spent 2 nights at Stanford Court San Francisco Hotel and an overall experience was excellent. The room was spacious and clean, the bed very comfortable. Staff was very friendly and attentive. The location is great, very close to many attractions. I will definitely return and highly recommend. We loved our 3 night stay here. The rooms were very comfortable, lovely high ceilings and very quiet. Buffet breakfast good start to day in lovely location. Omelette station well worth a visit. Good selection of fresh fruit. clean decent rooms, friendly reception, make quick response to queries via email. We enjoyed this old hotel in the heart of San Francisco. The room was very clean and comfortable. The staff at the front desk were friendly and efficient. The room is pretty big and very quiet. comfortable, convenient, located centrally; and price is reasonable and high C/P ratio. good location but rooms are very old and small... kinda overpriced but with locations, it's very convenient!! we have to request for in-room slipper . .. they don't provide room amenities, but we can request for. Designed hotel and best location. Love the detail and design of the hotel, Awesome!!! will come back for this hotel!!!! 沒有相親照，The room looks exactly the same as seen on the screen. 地點超讚！距離BART站步行2分鐘，拉著行李也不必擔心。Walk 2 mins to BART (Powell Street)station, located in CBD. 人員友善,下次來舊金山依然會考慮的住宿。Friendly staffs. Definitely recommend to my friends. Firstly we were given the wrong room a rookie error I guess. The manager stepped in and rectified the error and gave my wife and myself a complimentary bottle of wine 🍷 from there our experience just became better. Great location and all of the staff are super friendly and amazing to deal with nothing was to hard. Would strongly recommend to anyone wanting to stay in San Francisco! Friendly and helpful at all times. Staff very accommodating and deliver on what they promise. Very kind to our children. With its much desired location, San Francisco Downtown is the place to be while in San Francisco (CA). An array of attractions, including Bohemian Club, San Francisco Museum of Craft and Design, American Conservatory Theater, is a must-see while visiting the neighborhood. An ultimate location, San Francisco Downtown is reputed for shopping, restaurants, sightseeing as well as famous landmarks and outstanding hospitality. Be sure to seek out Agoda.com for the best rate available in San Francisco (CA). 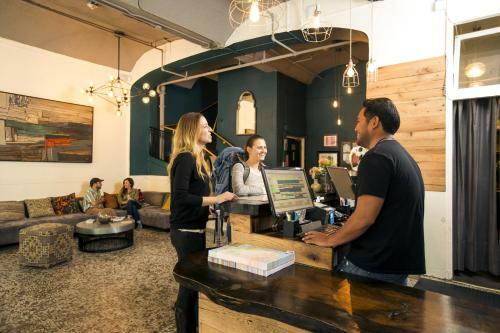 Be spoiled for choice as Agoda.com offers a wide variety of accommodations ranging from the family friendly Sweden House Hotel to the business oriented Touchstone Hotel City Center. To locate the best hotel deals in San Francisco Downtown, simply fill your travel dates in the search box.